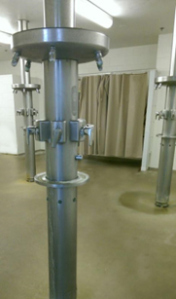 Bradley’s 6-person column showers have withstood years of use and abuse. These showers accommodate moderate to heavy traffic throughout the academic year. The largest user of these showers is the UW-Whitewater Swim and Dive Team, NCAA Div III. The women’s team consists of roughly 30 swimmers/divers that utilize the shower facility every Monday through Saturday during their season (late September to mid March). The local Club swim team, intramural water polo, and patrons of the Williams Center are also among the users of this particular locker room.